As the end of the year looms, it’s time to start making plans for the scant few weekends we have left at our disposal. It’s important to ensure we have enough energy for the final slog to the festive period, so a tranquil weekend away is a great idea for a 48-hour getaway. Farmstays are a criminally underrated option, especially for those looking for a family-friendly escape. We’ve created a list of five phenomenal farmstays that are only a few hours drive from Brisbane and the Gold Coast, so pick a favourite and pencil in a visit before everyone else catches on. Nestled in the heart of the Great Dividing Range is Bestbrook Mountain Resort, a charmingly rustic homestead that has been offering a traditional Australian farmstay retreat since 2004. Here, visitors will find self-contained cabins, bunkhouses and bush camping, where travellers can rest their head at night after partaking in wholesome activities during the day. Animal feeding, butter churning, billy tea and damper classes, wagon rides, whip cracking and horse riding are some of the farm activities available, while a swimming pool, local attractions and a licensed bar and restaurant offer more options for your down time. Cedar Glen Farmstay can be found in the foothills of the Lamington National Park on a converted cattle property that now acts as a humble hideaway for leisure seekers. Visitors are welcome to stay in one of four on-site cottages, from the original homestead building to a charming dairy cottage. At Cedar Glen, guests can participate in farm activities from animal feeding, collecting eggs and milking the cows, or can venture off the beaten path for an all-ages horse-riding adventure through the Lost World Valley and past the Albert River. If that wasn’t enough, Cedar Glen also offers a twilight four-wheel drive tour to the top of Jack’s Rocks to enjoy champagne and sunset views. High in the hills of the Sunshine Coast hinterland sits a rainforest retreat a offering much-needed respite from the manic moments of city living. 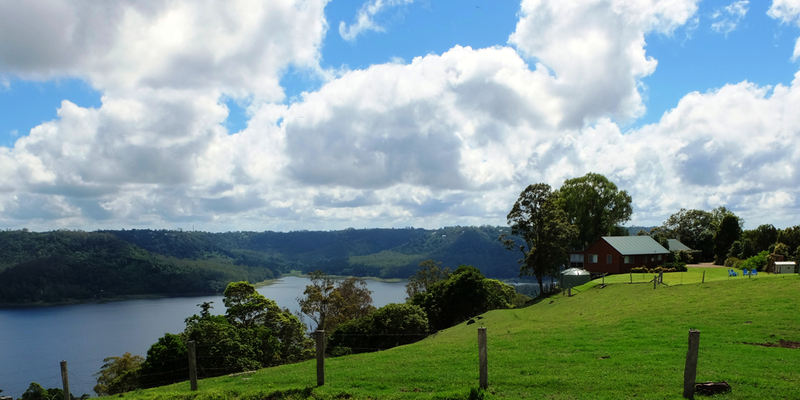 Wittacork Dairy Cottages is a modern working dairy farm that encompasses 150 acres of rainforest, as well as close proximity to neighbouring Lake Baroon and Kondalilla National Park. Self-contained cottages overlook the peaceful waters of Lake Baroon, with more than five kilometres of walking tracks navigating through the rainforest, over creeks and around waterfalls. Activities include pony rides, egg collection, milking sessions (with all milk going to Maleny Dairies for bottling) and wildlife spotting. 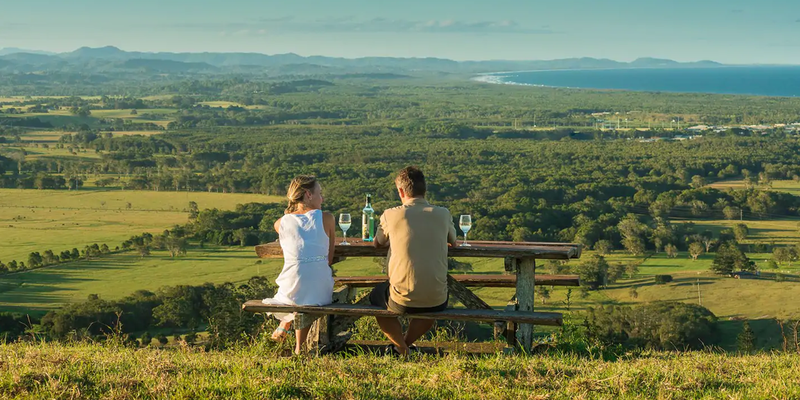 Overlooking Byron Bay from the top of Hayters Hill is a 300-acre farm that boasts incredible views of the Northern Rivers coastline, Mount Warning and the Byron Bay hinterland. The farm boasts protected rainforests, over 70 different bird species to spot and a meandering lake that feeds into the headwaters of Byron Creek. Couples and families are welcome to stay in on-site cottages, with numerous activities available to guests during their stay. 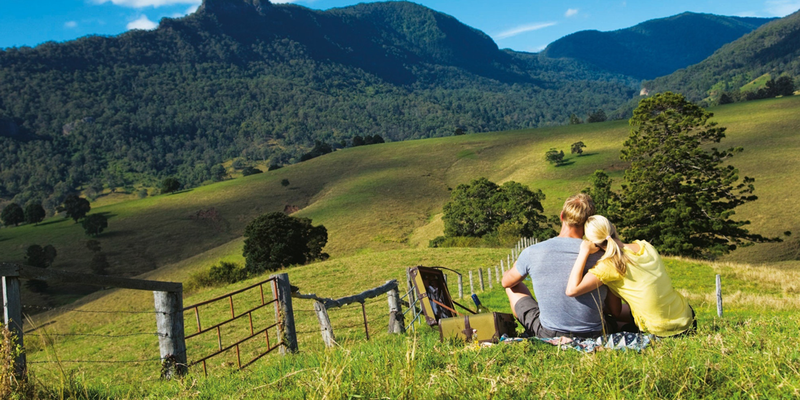 Go kayaking or fishing on the nearby lake, trek through rainforest gullies, walk amongst cattle and interact with the farm animals, or load up the car for a quick trip to Bangalow, which is only 10 minutes away. 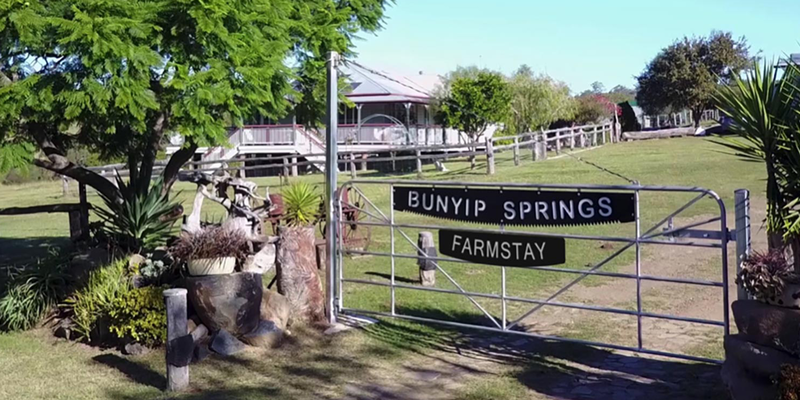 Offering an authentic rural experience is Maidenwell’s Bunyip Springs – a working beef cattle grazing farm of more than 250 hectares situated 23 kilometres from the Bunya Mountains National Park. Bordered by two creeks, the property offers eye-catching views and a plethora of scenery to explore. An on-site cottage, lodge and unit offer accommodation opportunities for visitors, with plenty of family-friendly activities on offer throughout the day. Gathering eggs, feeding the property’s various animals (including some friendly alpacas), nature walks, immersing yourself in nearby natural springs, horse riding or a visit to nearby Maidenwell will do wonders for the soul.